Predicting any market is challenging. However, some are claiming that the Bitcoin bubble has burst. If they are claiming this purely based on the percentage of the price decline, and do not have a quantitative model or other more synergistic/comprehensive rational (example history of accurate discretionary predictions), then be very wary of reading anything into such prognostications. As an aside, I have had a very fortunate record, mostly private but recorded, predicting Bitcoin calling many of the rallies and many sell offs including the most recent. The chart below is one I made which shows the peak to valley retracements. The analytics clearly show a pullback of this magnitude is within the normal. This obituary page shows a poor accuracy among those attempting to call the final top. What does this mean? First, it certainly doesn’t mean that the top is not in. However, it does suggest that if is calling it based on the magnitude of the current decline that it is probably unwarranted. While the more recent history is probably more reflective of current of conditions, the long history shows that Bitcoin has managed to recover from extremely brutal price declines. Falsifiable and bounded. Example: Market will be lower in 2 days. Market will test X before Y. Required. Synergistic, i.e. including price and non price data. In summary, based on the percentage of the decline alone, there is no evidence to conclude that the market behavior has changed. 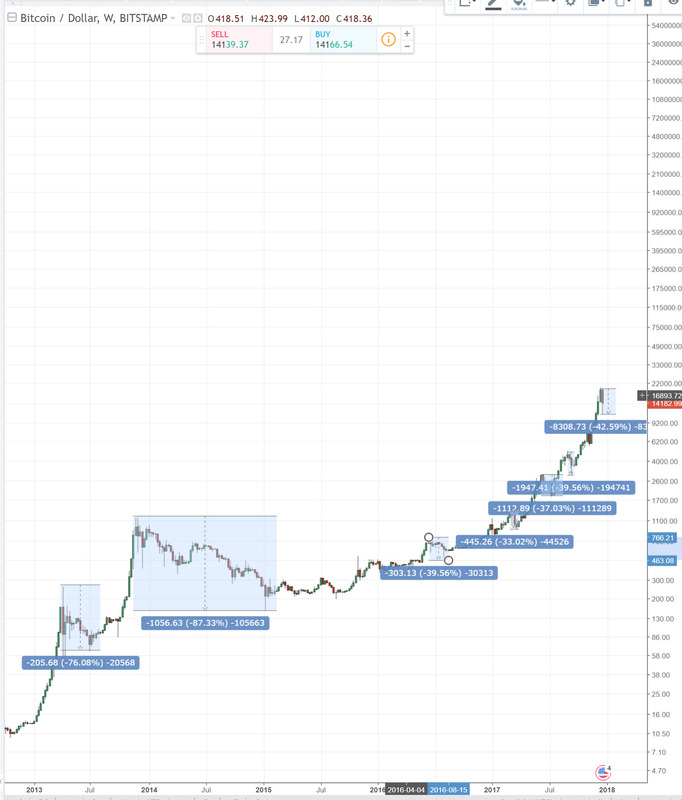 As well, while it isn’t clear if the older history is still relevant, examination of long term history reveals that Bitcoin has managed to recover from far more brutal sell offs. As well, one has to wonder how the market will have juice to extend the sell off when it is likely that a majority of leveraged long traders have been forced out.